My morning routine consists of rolling out of bed, taking a walk around the "lake" (my development's attempt to make the surroundings look like you're living at a lakeside retreat in Vermont when you're actually next to a highway smack dab in the middle of Indiana), showering, and then sitting down to savor a cup of French Press coffee and to do my warm-up sketching. Over the past month I have started an Illustrated Word of the Day project, which has quickly become one of my favorite projects of late. I have always loved big words. When I was 7 I told my dad's baseball team to expedite things so they could win and I could go home, and when I was 11 our message machine was my voice cheerily emitting phrases like "salutations from the Barker Domicile," "dispatch your communique subsequent to the auditory indicator," and "obliged to make a reciprocal call." My parents wrote it of course, but it was I who delivered it with such panache. My love for the written word and my devotion to drawing have never really crossed paths, but then I thought, "why not?" Here is the first week of the project (to begin to catch you up on where we are now). 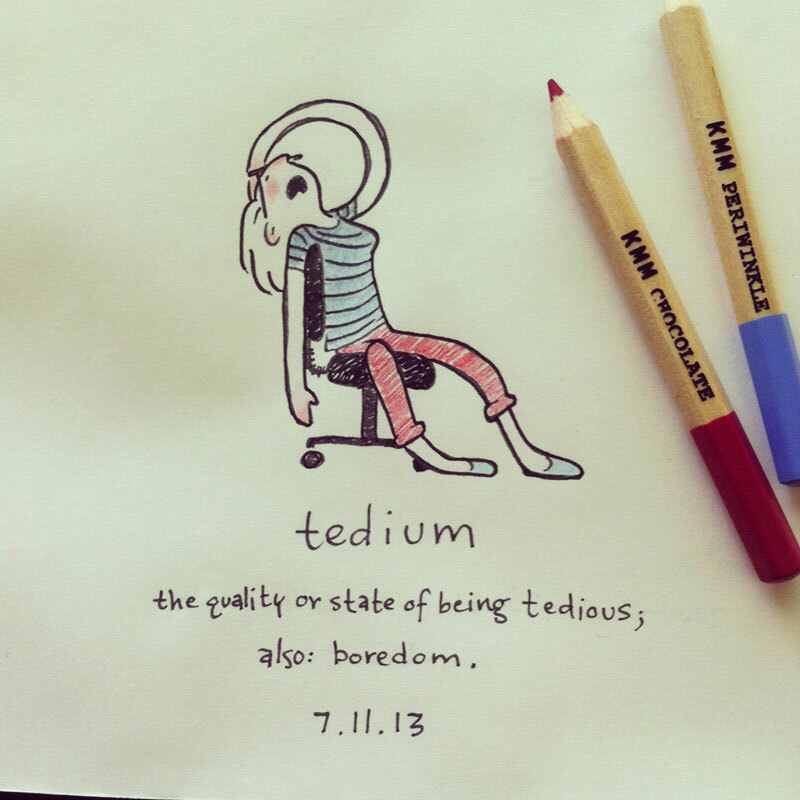 I randomly pick a word that interests me and illustrate it, depicting myself in whatever outfit I am wearing that day. I deliberately only give myself a small amount of time to complete each (they are, after all, just warm-up sketches).